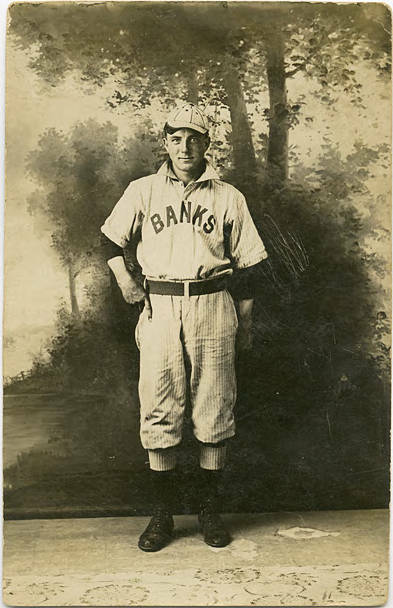 Sepia-toned image of a man in a traditional striped baseball uniform of knickers and loose fitting, short-sleeved buttoned shirt, with a baseball cap. He wears a dark, long-sleeved shirt beneath the light-colored uniform shirt, and his knickers are tucked into thick, two-colored socks that disappear into lace-up boots. 'Banks' is lettered across the front of his shirt. He stands in front of a misty, romantic outdoors background.